This is immediately what I thought of for "Crunch." It seems I am late, as usual, but I hope is illustration is worth wait. Thanks for stopping and, as always, comment are always welcome. "Crunchy" 8.5 x 12 Pencil & Pen with digital texture and color. well worth waiting for! 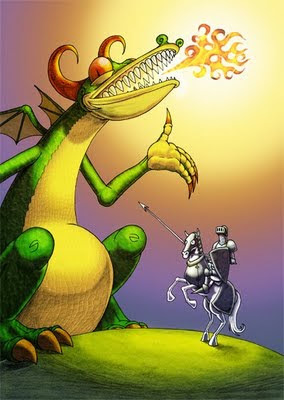 ... love the color palette and that dragon's expression! (he doesn't seem worried in the slightest about Sir What's-His-Name!). Melts in your mouth not in your claws! Awesome illustration. Josh... one of your best yet! Thanks for the kind words. I have to say your illustration and design is well rounded, the lighting dynamics on this illo is wonderful. Awesome and great lighting effects!